SEJONG, March 23 (Korea Bizwire) – The Sewol ferry was raised from the sea Thursday after an overnight salvage operation, some three years after its sinking that resulted in the deaths of 300 people and left nine missing. “The side of the hull is currently some 6 meters above the sea as of 2:00 p.m.,” said the Ministry of Oceans and Fisheries. 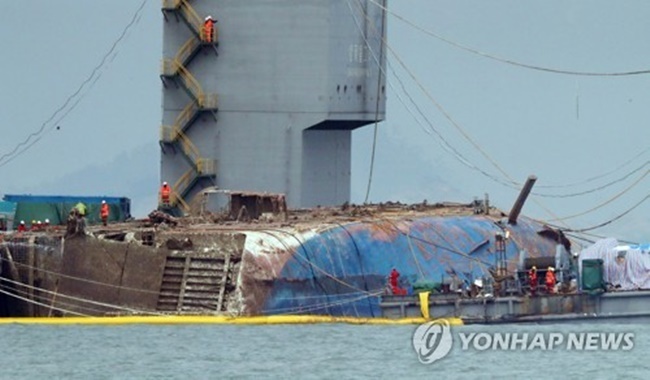 Two salvage barges raised the 145-meter-long, 6,825-ton ship that had been lying about 40 meters under water off South Korea’s southwest coast near the island of Jindo. The sinking that occured in April 2014 is the worst maritime disaster in the country’s history. The ministry said the operation to hoist the upper part of the hull some 13 meters above sea level is expected to be finished by late afternoon. The procedure has been delayed several hours as the ship made contact with the pulley of the two barges tasked with the lifting. The salvage operators will finetune the position of the vessel and balance it before lifting it to the desired height. 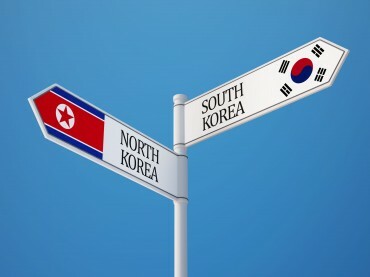 If the lift is successful, the salvage barges will then move the hull onto a semisubmersible ship, which will carry the ill-fated ship to the port of Mokpo, according to the ministry. After the ferry safely leaves the accident site, the ministry said divers will search carefully for any remains left in the water and on sea floor. Authorities said underwater fences surrounding the area where the Sewol sank have been set up. 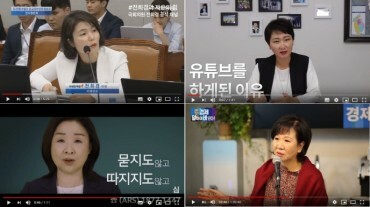 Efforts to lift the Sewol started at 10:00 a.m. on Wednesday following several hours of careful examination of the weather conditions because the sea must be fairly calm. Waves must be under 1 meter and the wind speed needs to be below 10 meters per second. At 3:30 p.m., the ferry was carefully test lifted 1 meter from the sea bottom and salvage workers carried out balancing procedures before committing themselves to pulling the hull out of the water. Divers also checked the underwater situation to make certain that the operation will go smoothly. The ministry said all technical aspects and local weather conditions were reviewed at the time of lifting. The upper part of the hull emerged from the water before 4 a.m. Thursday. 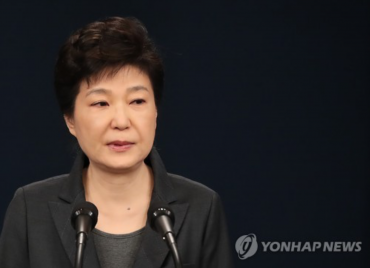 Earlier, the Seoul government decided to pull the ferry out of the water intact in order to protect any remains of people still missing from the tragic sinking and carry out a detailed investigation into the ship’s sinking. The 85.1 billion won (US$72 million) project to recover the ship is being conducted by a Chinese consortium led by China’s state-run Shanghai Salvage.